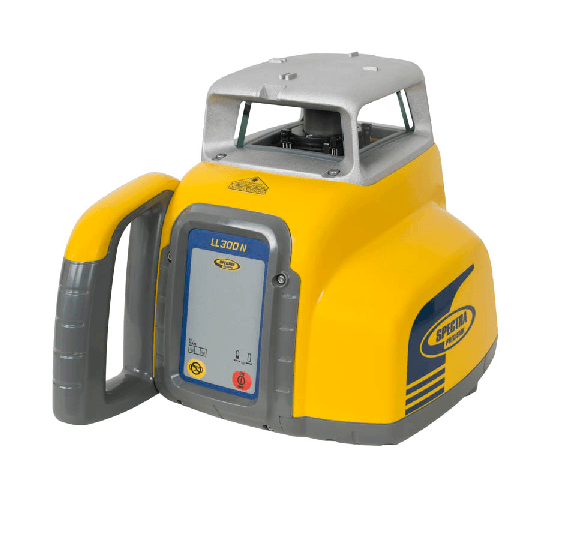 The automatic, self-leveling Spectra Precision® LL300N Laser Level is the most rugged laser level available, tough enough to handle a wide variety of general and concrete construction applications. Even in harsh job site conditions, the LL300N delivers consistently reliable and accurate performance, enabling you to work faster and smarter. 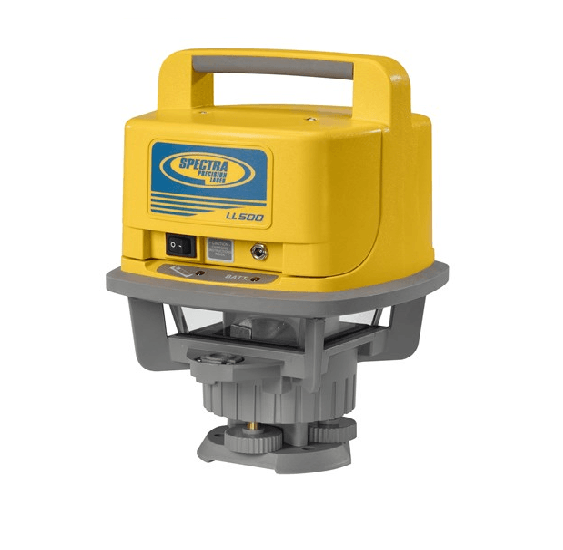 The rugged LL300N laser can withstand drops of up to three feet (one meter) onto concrete and tripod tip-overs up to five feet (1.5 meters). This strength, combined with full weatherproofing and dust-proofing, reduces downtime and lowers repair costs over the life of the product. The LL300N laser’s self-leveling capability and optional RC601 remote control result in outstanding accuracy and ease of use. Since the LL300N laser levels itself when turned on, setup is easy with fewer controls to deal with. The RC601 remote control gives you the option of matching slopes or having slopes on grade. It also offers single-axis slope including HI warning control with the other axis continuing to level itself. 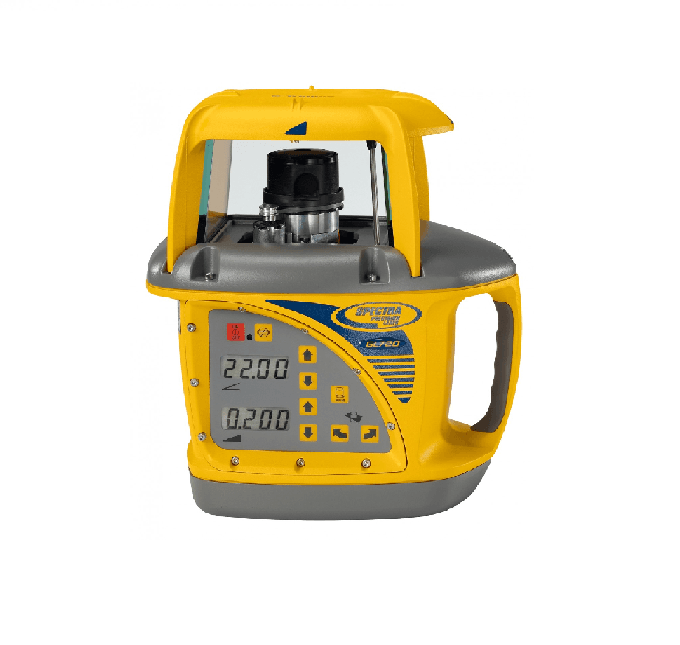 The full featured automatic, self-leveling Spectra Precision® LL300S Horizontal Laser Level is the most rugged laser level available, tough enough to handle a wide variety of general and concrete construction applications. Even in harsh jobsite conditions, the LL300S delivers consistently reliable and accurate performance, enabling you to work faster and smarter. The rugged LL300S laser can withstand drops of up to three feet (one meter) onto concrete and tripod tip-overs up to five feet (1.5 meters). This strength, combined with full weatherproofing and dust-proofing, reduces downtime and lowers repair costs over the life of the product. 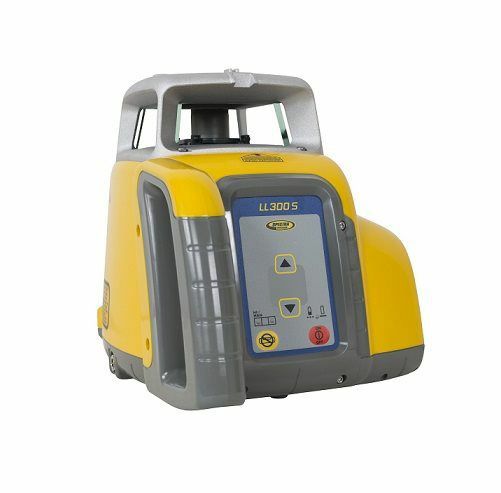 The LL300S laser’s self-leveling capability and optional RC402N radio remote control result in outstanding accuracy and ease of use. Since the LL300S laser levels itself when turned on, setup is easy with fewer controls to deal with. The arrow buttons at the laser offer easy grade matching with a controlled slope setup using the HI-alert function. The optional RC402N radio remote control makes slope matching to a single person operation. Rugged, Reliable LaserLeveling SystemsSetting the Industry StandardAccurate, stable and very reliable, the Spectra Precision® Laser LL500 is the ideal one-person leveling system for a range of everyday elevation measurements on the construction site.Designed for use on the jobsite, and reliable even in the harshest of conditions, today more contractors around the world use Spectra Precision Lasers to increase productivity and profitability. Temperaturecompensationallowsyoutomeetyour toughest accuracy requirements in any type of variable environmental conditions. Reducestheamountoftimerequiredforeachgrade shot, so more grade shots are taken for increased accuracy. Eliminatesreworkcausedbymiscommunicationor out-of-level instruments with built-in out-of-level warning and shut-off. Immediately locates thelaser plane with the visible spotting beam. The automatic, self-leveling Spectra Precision® GL412N single grade laser is the most rugged, cost-effective lasers that do three jobs—level, grade, and vertical alignment. Even in harsh jobsite conditions, the GL412N delivers consistently reliable and accurate performance, enabling you to work faster and smarter. 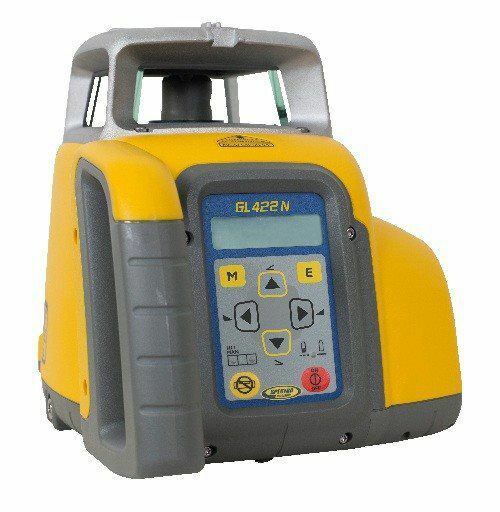 The rugged GL412N laser can withstand drops of up to one meter (three feet) onto concrete and tripod tipovers up to 1.5 meters (five feet). This strength, combined with full weatherproofing and dustproofing, reduces downtime and lowers repair costs over the life of the product. The GL412N laser system now includes the advanced HL760 Digital Readout (DRO) receiver that provides automatic Grade Match, PlaneLok and Fingerprint function. The GL612 is a single grade laser and the GL622 is a dual grade laser. Both are rugged, automatic self-leveling lasers featuring grade capability of ± 25% and can be used in a wide variety of grading, excavating and alignment applications by general and specialty contractors. The GL612 and GL622 include the RC602 full-function radio remote control which offers advanced automatic features like Grade Match, PlaneLok and Automatic Axis Alignment. The remote as well as the transmitters have an intuitive graphic display which is back-lit for ease of viewing. Contractors can do everything with the remote control that they can do at the laser keypad, up to 100 meters (330 feet) away—even from the cab of a machine. The ability to make grade changes remotely can significantly reduce setup time and speed operations. 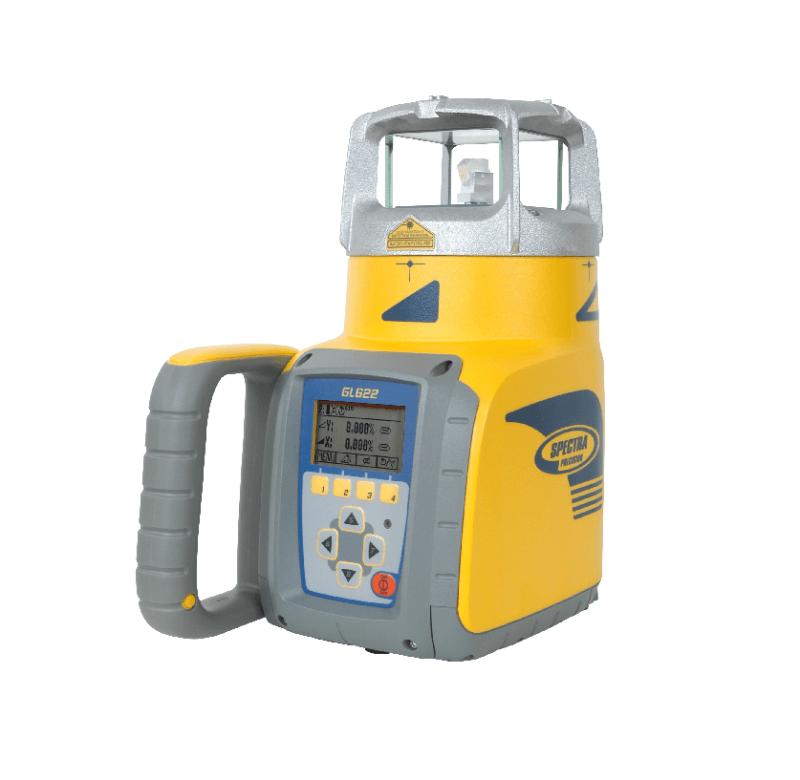 Each laser package also includes the advanced HL750 Laserometer that provides a digital readout of elevation and can be used at an operating diameter of up to 800 meters (2,600 feet). Wireless communication between the HL750 Laserometer and the transmitters provide automatic Grade Matching which allows measurement of unknown grade values between two points. For applications that require maximum stability and accuracy, PlaneLok is available in both the horizontal and vertical planes. PlaneLok automatically locks the beam on the receiver and keeps it on grade. This reduces typical environmental factors that may induce an error. In addition, the HL750 Laserometer can communicate with another HL750 for long-range wireless remote display and monitoring. The GL612 and GL622 Grade Lasers self-plumb in the vertical position to allow an even wider range of applications such as such as anchor bolt installation, form, tilt up, and curtain wall plumbing. With its rugged design, the GL612/622 Grade Lasers can survive a drop of up to 1 meter (3 feet) on concrete. The laser also features IP67 moisture and dust sealing to handle the tough construction environment. The GL612/622 Grade Lasers retains all well accept functions of the GL500 series lasers with additional advanced features and benefits offering much more versatilities. Electronic Leveling Vibration Filter dampens vibrations typically experienced on tall tripods, in high winds, or on high vibration jobsites. 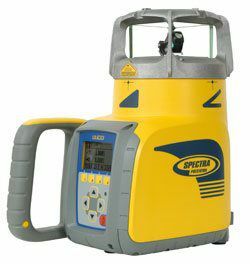 The Spectra Precision UL633 is the first construction laser allowing total automatic control of all three axes (X/Y/Z). Control of the Z axis is accomplished through the new "fan beam" technology, while control of the X and Y axis utilizes a dual radio connection. Benefiting of all the know-how of Spectra Precision, the UL633 is appropriate for all applications producing an easy, fast and accurate job. The universal laser can provide precise automatic axes alignments to two desired points without positioning the receivers 90 degrees perpendicular. 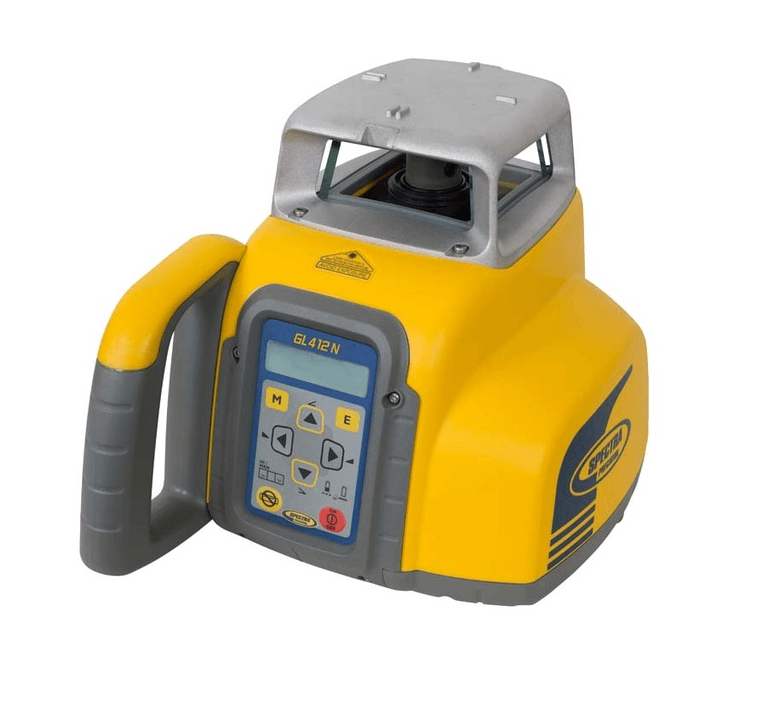 This allows contractors to perform easily dual axis alignments for applications such as grade work on sports fields, parking lots, tennis courts and driveways. Since the UL633 can work with two receivers simultaneously, contractors can measure an unknown grade value automatically between two elevation points in Grade Match mode. On jobsites where maximum accuracy and stability is required such as airport runways, elevations can be precisely secured using the automatic Dual Axis PlaneLok feature. This capability locks and maintains the laser reference plane to two receivers placed at existing elevation points, eliminating drift or possible errors caused by vibrations or temperature changes. The UL633 is also the first laser where the plumb beam can be changed into a rotating fan beam which can be detected by the new SpotFinder SF 601. The UL633 can align the plumb beam automatically to the SpotFinder for pipe laying and trench applications. Measuring a grade value through an existing pipe or an open trench can also be done quickly and easily in automatic Spot Match mode. The UL633 and the Spot Finder offer additional versatility for 90 degree layout applications on concrete pads as well as indoors for drywalls. Activating the SpotLok mode ensures the UL633 locks and holds the plumb beam automatically to the Spot Finder at the desired direction or elevation point offering a precise alignment to avoid rework. The UL633 includes a full-function combined radio and infrared remote control RC603, with a built-in back-lit intuitive graphic display. Contractors can do everything with the remote control that they can do at the laser keypad, up to 100 m (330 ft) away from the laser -even from the cab of a machine or through a pipe. The ability to make grade changes remotely can significantly reduce setup time and speed operations. With its rugged design, the UL633 can survive a drop of up to 1 meter (3 feet) on concrete. The laser also features IP67 moisture and dust sealing to handle the tough construction environment. The UL633 Universal Laser retains all well accept functions of the GL500 series lasers with additional advanced features and benefits offering much more versatilities. 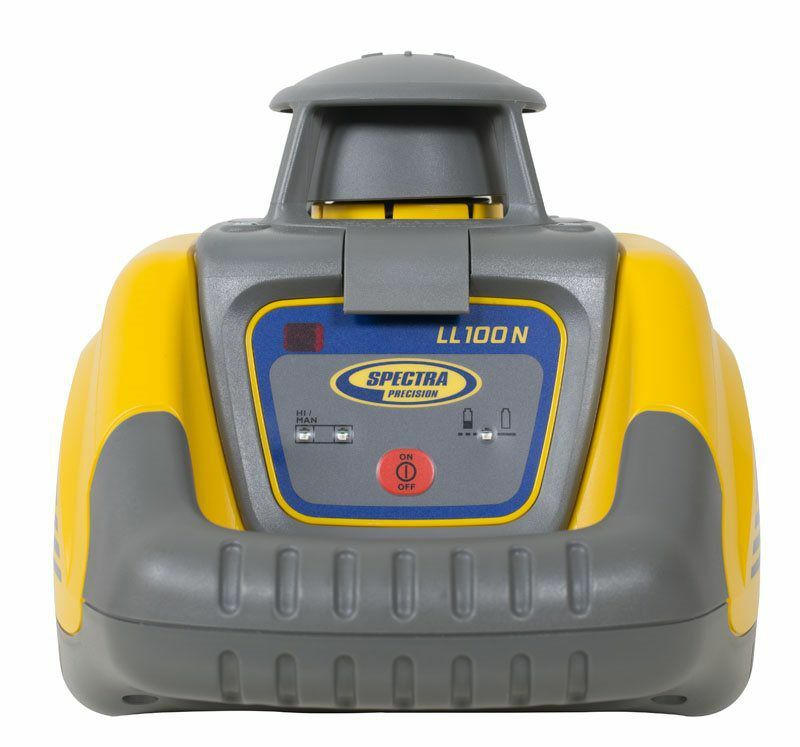 The fully automatic, self-leveling Spectra Precision® Laser LL100N sets a new standard in rugged reliability, handling a wide variety of general construction applications. Even in the toughest job site conditions, the LL100N consistently delivers reliable, accurate performance to increase your overall productivity and cost-savings. The LL100N laser mounts on a tripod and sends a 360° plane of laser light over the entire work area, allowing one person to take accurate, self-leveled elevation measurements up to 575 feet (175 m) away with the HR320 laser receiver. The LL100N is designed to be durable and reliable, day in and day out, and features superior drop and weather protection. The tough LL100N laser can withstand drops of up to 3 feet (1 m) onto concrete and tripod tip-overs up to 5 feet (1.5 m). This ruggedness results in reduced downtime and lower repair costs.